Outlander is a mixture of pure drama, history, and time travel, making it a perfect series for those who want to chill and learn at the same time. Want to catch up in time for the upcoming seasons? Find out how below! What if you could travel back in time to change history itself? 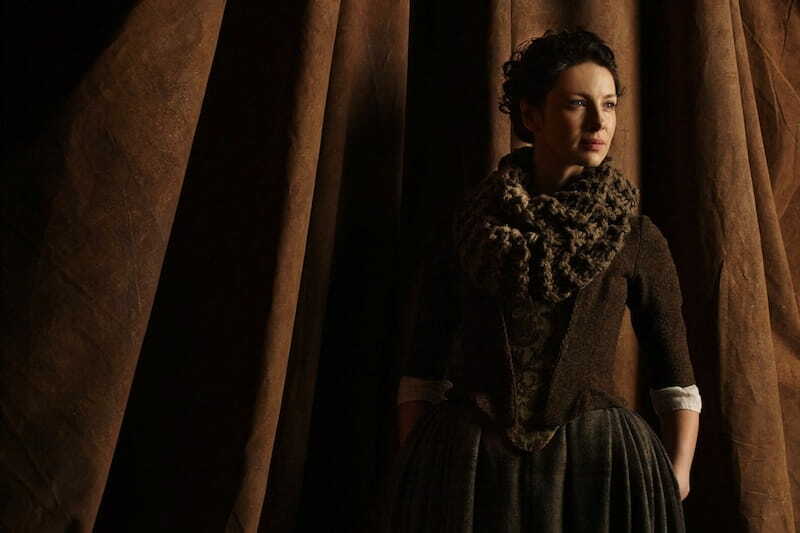 That’s what former WWII nurse Claire Randall (Caitriona Balfe) does when she finds herself transported back to 1743 Scotland, where she encounters Jamie Fraser (Sam Heughan), a Highland warrior, and becomes caught up in the Jacobite risings. Outlander is based on Diana Gabaldon’s bestselling book of the same name and is produced by Sony and Left Bank for STARZ, an American premium cable network. The fourth season premiered on November 4, 2018 with 13 episodes and STARZ has renewed the series for a fifth and sixth season. You can watch Outlander on Sundays at 8/7 c on STARZ. If you can’t watch the series on its dedicated time slot or want to catch up to the fourth season, here are the official and unofficial ways of watching the series online. If you go to the official site of STARZ, the producer of the series, you can watch all the episodes of the series up to the current season. You can do this by either subscribing to STARZ On Demand (the premium streaming service of the network), or start your 7-day free trial. Sadly, the subscription is only limited to residents of the U.S. and Puerto Rico. Bummer. STARZ On Demand Pricing: $8.99/month, with free access to the application made available for premium cable subscribers. Having no STARZ On Demand subscription means that you have to look for alternatives. This is one. 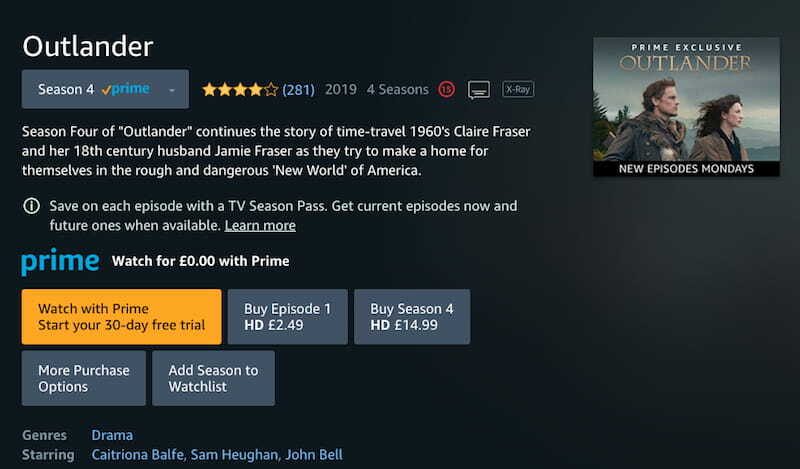 In case you didn’t know, your Amazon Prime subscription could also be used to watch Outlander episodes. You can stream or buy Seasons 1-3 separately which are available on site, either per episode or bundle. However, you can only stream Season 4 if you’re a UK subscriber, or in the US if you’re subscribed to STARZ On Demand via Amazon. Again, don’t worry! You can use a VPN to bypass this restriction. Just scroll down below to find out how. Another thing–even though the 4th season can only be streamed through its official partnership with STARZ, you can buy it in the future after the final episode airs later this month. Amazon Prime Pricing: $2.99/$1.99 (HD/SD) per episode; seasons 1 parts 1 & 2 for $19.99 each; seasons 2 & 3 for $29.99 each. Note: The bundles include bonus content so if you have the money, go buy it! Since STARZ is the exclusive distributor of the series in the US, and Amazon Prime UK is exclusively available to its residents, where do you go if you’re not residing in either? Netflix. Apparently, Netflix has made the series available across several regions, which include Australia, Canada, mainland Europe, Latin America, and most of Asia. This means Netflix does not carry Outlander in either the US or the UK, only outside these regions. If you’re not in either country, all you need to do is register on Netflix, subscribe, then stream. That’s it. Or you can just go download it so you can re-watch it when you want. If the series is not available in your region, give our best VPNs for unblocking Netflix a try when you have the time. Netflix Pricing: Basic plan starts at $8.99/month on 1 device; Standard HD is at $10.99/month for 2 devices; Premium Ultra HD is at $15.99/month for 4 devices. If you don’t have a subscription for the previous three, then Hulu can be your friend. Its partnership with STARZ makes it a very close competitor to both the network itself, Amazon Prime, and Netflix so you can be sure of premium streaming. All 54 episodes of the series are available for streaming on the platform. However, Hulu is only available in the US, so if you’re outside the country, you’ll have to use a VPN to access it. Worth noting is the fact that since it’s a partnership, you have to top up your premium account in Hulu to be able to stream content produced by the network. Just add STARZ to your current Hulu subscription and off you go to Scotland. Are you a U.S. resident? If so, then you can also consider adding Apple iTunes to your list of alternatives. It has all the seasons of Outlander at slightly different pricing points. To save money, you can buy the three seasons as a whole, together with the bonus footages and other special clips. That gives you about $40 in savings! Like Netflix, iTunes also lets you download the episodes separately. It’s ideal if you want to watch the series on-the-go, especially if you have an iOS device. Apple iTunes Pricing: Seasons 1 and 2 for $29.99; seasons 3-4 for $39.99 (includes a season pass for season 4); seasons 1-3 bundle for $59.99 (as opposed to $99.97 if you purchase the seasons separately). Fine. You don’t have an account or money to subscribe to premium streaming services. You’re in luck because we also compiled some unofficial ways to watch the series online. Scroll down below! You will not find episodes of the series on YouTube due to its copyright infringement policy. But then again, there’s Dailymotion. It’s your safest bet when it comes to streaming services, but you might not find all the episodes you’re looking for. Some videos might be fake and others might provide links which redirect you to some external website which can potentially harm your computer. Not technically the safest bet but it’s better than nothing, right? Dailymotion not working? Try this site. If you stay on the internet most of the time, then you’ve probably come across Openloadfreetv. It’s one of the recommended streaming sites for movies or TV titles on any platform. No need for registration or anything. 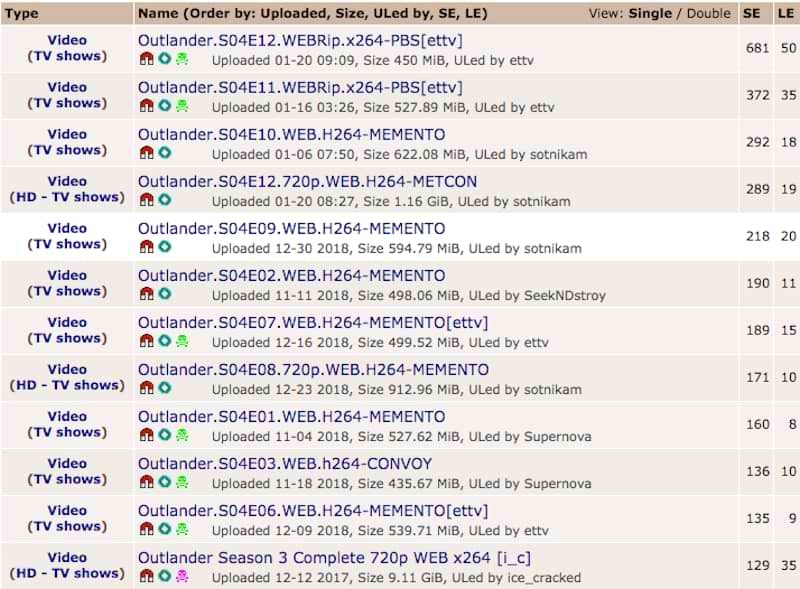 Just type Outlander in the search bar and the site will do the work. But just like a lot of unofficial sites, it has ads and pop-ups which can be annoying most of the time. Always enable your AdBlocker when you visit for safety (or subscribe to a premium VPN which offers protection). If the two previous methods didn’t do the job, then Google, my friend. Type “where to watch Outlander online for free” or “watch Outlander episode 1 free” to get a list of sites where you can stream the series. Go through each and every link you find because not all these sites are guaranteed to work. However, we remind you that since you’re looking through lots of websites through links, you risk exposing your computer to malware and viruses. As such, we don’t recommend this method. Make it a last resort. You can try torrenting if you want, but we do not condone it. It is illegal and punishable by law so by all means, stay away if you don’t want to risk the consequences. Now, it’s another thing if you download the episodes when you already own them from a legitimate streaming service for some reason. However, once you share even a tiny bit of it online, you also risk breaking the law. Do yourself a favor and educate yourself about VPNs, so you can avoid facing jail time. Alternatively, you can also check out our best VPNs for torrenting to keep your activity private and secure. Itching to watch Outlander only to find out that it’s not available in your region? Sad! We know. That is why we strongly recommend users like you to use a VPN. What is a VPN, you may ask? A VPN is a private network which routes your traffic to any of its servers around the world, enabling you to browse your favorite series, even if it’s not available in your region. It also cloaks your computer so you can browse any site undetected. These VPNs will allow you to stream Netflix, STARZ, Amazon, or other streaming services that are geo-locked. Check out our two highly recommended VPNs below if you don’t know where to start. ExpressVPN tops the list of our highly recommended VPNs because of the reputation it has established over the years. 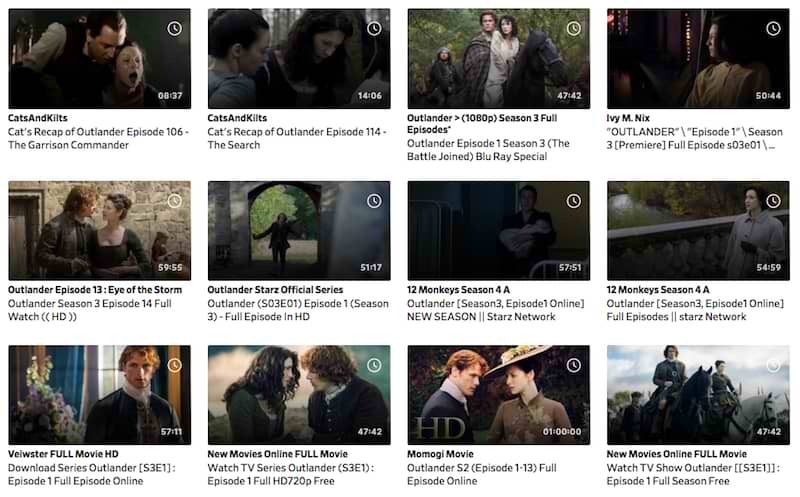 If you want to watch Outlander on STARZ, then this is for you. It has absolutely everything you can find in a premium VPN service – it has 24/7 customer service (perfect for beginners), high internet speeds, guaranteed Netflix access, and most of all, it allows torrenting. Imagine all these services for just $8.32/month for a 1-year membership. That’s not a lot when you compare it to how much you’d pay for a premium streaming service subscription. ExpressVPN’s price tag might be intimidating if you’re just starting out, so if that’s the case, go with our second best bet, NordVPN. At $2.99/month for a 3-year subscription, it is no doubt one of the most cost-effective VPN services in the market, and a much cheaper alternative for a premium VPN. It’s exactly the same premium service as ExpressVPN for less money, and yes, it also supports torrenting. 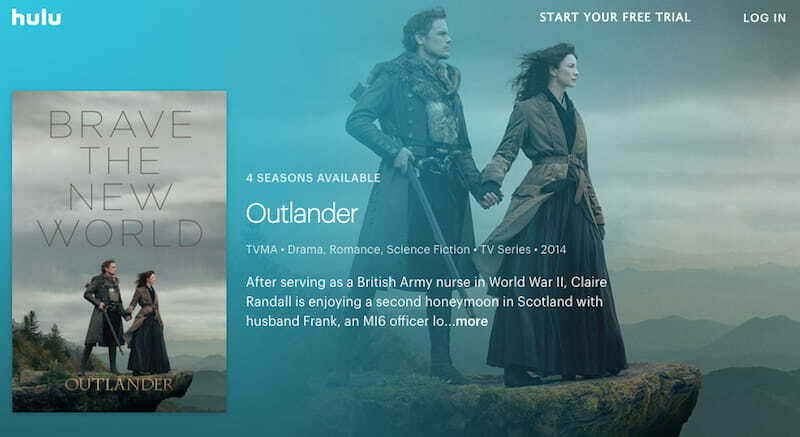 With all these recommendations we’ve given, you can finally start binge-watching Outlander in no time! There’s still a long stretch before the release of the fifth season, so you have time to watch all 55 episodes of the series. Don’t forget to unblock geo-restrictions with these top VPNs for unblocking streaming sites. Sit back, relax, and enjoy changing the course of history with Outlander!